Happiest 5K on the Planet? Hell yeah! As you read in my previous post, a friend of mine from high school, who I last saw at a high school graduation party back in Horseheads, New York…in 1998…was coming into town. She was one of my dearest friends going up. In fact, we were both single at the time of the senior prom (and I was already a graduate), so we decided that we would attend prom together with our friends. I am, of course, talking about my good friend Marisa, who reconnected with me awhile back on Facebook. God bless social media, yes? Anyway…through a wild and crazy turn of events, she wasn’t able to run The Color Run up in New York or New Jersey or wherever it was being held. So…she got in touch with me and inquired about the Louisville race. I was already signed up to run it because last year I had missed out due to a running injury (many tears were shed on packet pick-up day last year). She inquired about coming down to Louisville for the race and, naturally, hanging out with me. I told her she was always welcome…and now the Happiest 5K on the Planet just became a little…no…a lot happier. Marisa, mind you, lives in New Jersey and works in New York City. On Friday night, she was to catch a flight down to Louisville and arrive around 11:45 p.m. Thanks to the very unhappy Tropical Storm Andrea bearing down on the Northeast, her bus to LaGuardia was running way behind due to flooding. All night, edging up closer and closer to her flight departure time, she’s texting from an unmoving bus, not certain if she was going to make her flight. Through a bit of a miracle, her flight was delayed, her bus got through some flooding, and she made it to the airport in enough time to make the delayed flight out to Louisville. So, at about the time she should have been arriving, Cathy and I hop into my vehicle and drive out to the Louisville airport to await the arrival of her plane. We parked and headed inside…it was really close to midnight. Her plane landed and soon…she was texting to say she was heading toward baggage claim. I let her know that I was there and waiting…and a few moments later, she stepped out of the terminal and I hurried up to give her a hug. It was definitely way past our bedtimes. After midnight, we made the trek back to Indiana to crash for a couple of hours. I was already in my pajamas and ready for bed, so I showed Marisa to her air mattress, where the bathroom was, and allowed for her to get her night routine done before we all turned in for the night. My alarm was set to wake us up at 5 a.m. My coffee maker was set to start automatically at the same time. This was not a coincidence. This was necessity. At 6 a.m. sharp, my alarm goes off and I switch it off, roll out of bed, grab my whites to wear to the run and go to get changed. I get everything done except putting my hair up. I totally forget about that. It’s early. I’m tired. The coffee is just finishing up brewing. I stumble out of the room to get some breakfast ready and allow Marisa some time to get ready. As I’m getting cereal poured and some Greek yogurt prepped, I notice that Cathy’s door is still closed and there is no sign of life. So, I grumble to myself (not a good attitude for the Happiest 5K on the Planet, right?) something about not being her mother and knock, loudly, on the door. I hear her stir and I go back to the kitchen, this time to pour some water, pour some coffee (it has now stopped brewing and is ready to wake me up), and lay out three bananas to eat on the way to the race itself. Marisa is not much of a coffee drinker, but she loves tea. So I get some hot water on the stove for her and let her choose her cereal. She went with the Vans Gluten-Free Cinnamon Heaven, which, in my opinion, is the best option that we had. LOVE my Van’s cereals. But, I digress. She picks out the Celestial Seasonings Pumpkin Spice tea for some caffeine and we get it steeping in some hot water. While that works, we settle in for breakfast with some cereal (carbs) and Greek yogurt (protein). We hydrated with water, caffeinated with our coffee or tea, and then get to brushing our teeth, getting our numbers pinned on, getting our shoes on (I dug out my very old pair of Brooks Adrenaline for this…their final race), and then I remembered to do my hair. So did Marisa for that matter. I wasn’t alone. Originally we had wanted to do some costuming…go as superhero princesses…but we just didn’t have the time nor the money at that point to work it. But…we’re already planning for next year, so expect some greatness with that. With that being said, we tried to emulate each other as much as possible. She wore rainbow socks…so instead of the white socks I had laid out, I grabbed my rainbow socks. We both were in white t-shirts. We both wore pigtails…hers were braided. Then over that…the official The Color Run sweatband. NOW we were ready to head out the door and get to the race. Being that we put some hustle into our morning routine, we were leaving just a little later than anticipated. But, we only had a short drive over the bridge and then over towards The Galt House to park. So, we weren’t in too bad of a shape. I noted the time soon after we left the apartment and it was already banana time. So, Marisa and I, being that we were running, both ate our bananas while Cathy said she’d eat hers on the walk toward the start line. That worked. This gave Marisa and I time to eat without being rushed and let everything settle in our stomachs. Parking was hassle-free and worry-free. No problems at all. We climbed out of the car in the parking garage and off we went to make the trek toward the start of the race, which was happening in and around Waterfront Park. We know our way around downtown by now, but there was no way to even think about heading in the wrong direction. The sea of people in white shirts and costumes was enough to let us know we were heading in the right direction. 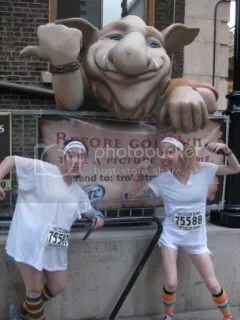 As we stepped out into the streets, Cathy decided that we would go the more scenic route toward the start line, which would take us past Louisville’s famous Troll Pub Under The Bridge, and their infamous troll. We had to pause and take pictures with said troll before making our way to the sea of humanity known as…the starting corrals. 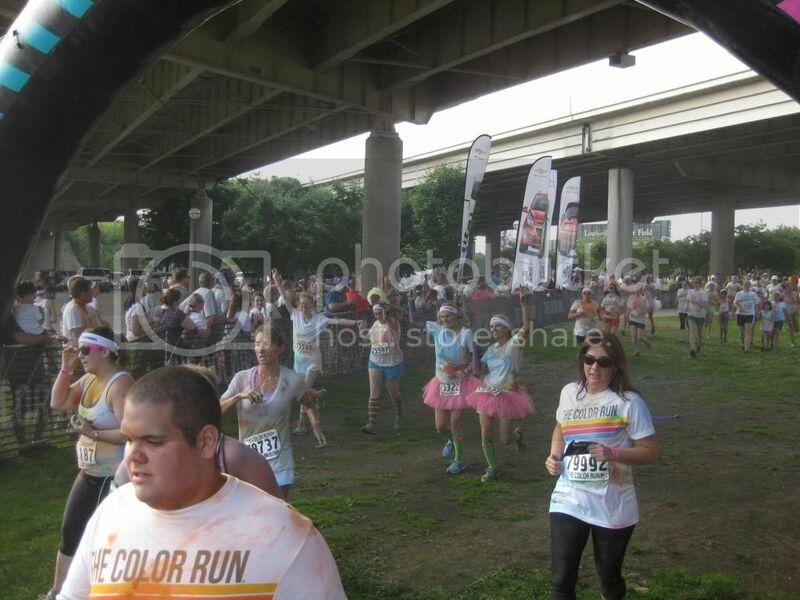 Cathy said that she would find a spot near one of the breaks, so Marisa and I meandered through the waves of Color Runners to find an opening that would allow us to get into the corrals. We finally found it and ducked inside, now having to wend our way back to where Cathy had positioned herself. I wanted to hand off my cell phone. It took some clever maneuvering, but we managed to finally make it up to where Cathy was waiting. I handed her my cell phone and found enough space to show Marisa a few of my stretches I do before a race. The DJ at the event was cranking out tunes, people were having a great time, free stuff was being tossed out to all the runners within the vicinity. It was just a fun, happy atmosphere. I don’t think Marisa and I stopped smiling. They were getting ready to kick off the race, which was starting in waves. Probably the only sane way to keep this race somewhat organized. It just so happened that Marisa and I were in the second wave to be sent off. Go figure. So, after the first wave left to go and get doused in color, we were moved up behind the green tape and stood around for, probably about 5 minutes. More free stuff was hurled at us. People were opening up their packets of color and tossing it in the air. I got a bit of a color coating before I even left the starting gate. I was okay with that. The entire point of this race is to leave it pristine white and return…coated in the rainbow of colors they toss on you. The countdown was started, the tape was pulled away…and my group was off and running. Here’s the best part about having a friend in town for a race. I promised Marisa I would run or walk, whichever she needed to do, with her…the entire way. She had said she didn’t want to slow me down, but she came down here to run a race with me, we were totally going to do it together. This is not an event you run for speed, and even if it had been, I still would have stuck with her. That’s what friends do! We were hitting the streets of Louisville, running down River Road, and having a good time. I let her set the pace and she actually was taking it at a conservative, but good clip. I was proud of her. And soon, we were coming up on our first color station. Neither of us had done a Color Run before, so we weren’t sure what to expect, but as we ran under the blue arch, we were suddenly being sprayed with blue paint powder from the volunteers there. It was awesome. And as we exited the cloud, we both agreed that blue didn’t taste very good. Moving on…we struck out for the next stretch of road. And that was how it worked. The next color station, the green station, we now knew the routine. We ran close to the side so that we would get some color on us for certain. I was laughing, because while Marisa was managing to get coated in color, the volunteers were hitting me from the waist down. It was amusing. 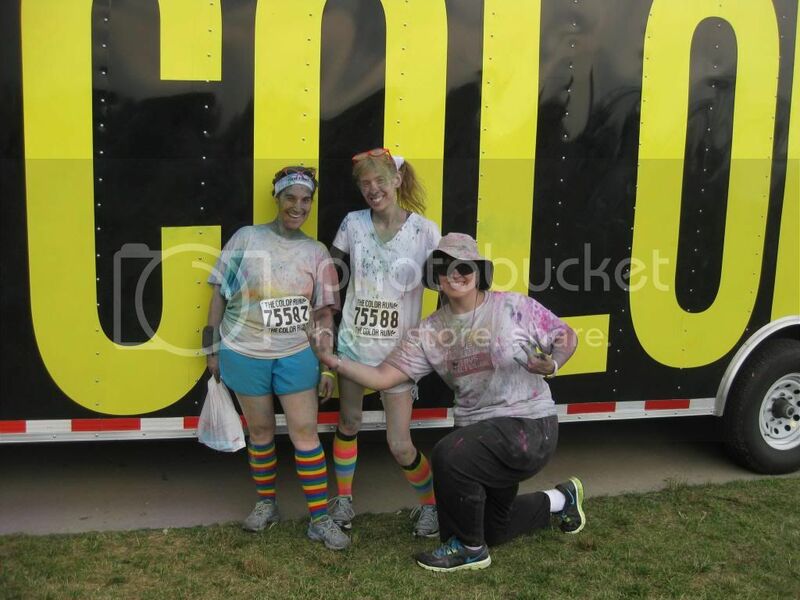 So, my legs were quite colorful at this point. At the water stop, we gratefully took offered water. We drank some. We rinsed our mouth out with it. We took a moment to regroup, and we were back on track to hit up more color. As we came to the turn around point, we were hit up with some colored water out of a super soaker. NICE touch. I think I finally had some color on my shirt now. YAY!! Back down the other side of the road we went, ready to get coated at least twice more with some color. We hit the orange station, or as they called it, “Oompaloompa Land”…and discussed Oompaloompas as we were getting a nice dousing of orange color. We held our breath through the cloudy orange haze and came out on the other end. Moving on. We made sure to grab more water, get our mouths rinsed out again, and continue on for the last portion of the race. The last color station was pink and Marisa really got it here. My legs, once again, were the recipient of my color. Now painted up in the colors of the rainbow, we were now heading back toward downtown Louisville. We actually ran past the start line and could hear them still sending off waves of runners. This event had sold out…so there were a lot of participants. Given that we weren’t blitzing through this race, it was awesome to make it back to this point and still see pristine white-clad runners about to head out. We were actually surprised this was still happening at this point. Up into Waterfront Park we went…and that was when I could see the Finish Line gate. I turned to Marisa and pointed to it. We linked hands…and we dashed in for a strong, colorful finish. And we were laughing, smiling, talking, and having a great time…the entire time. It has definitely become one of my favorite race experiences. After finishing, we met back up with Cathy, who was waiting for us at the finish line. One of the Color Festivals was happening near the stage, so after grabbing some free Kind Bars and some water…the three of us headed down that way. They were tossing out extra color packets to the crowd, some free The Color Run swag, and hitting us up with super soakers in the process. Nice. Marisa and Cathy were able to tear into their color packets to prepare for the next Color Festival…but I was having trouble with mine. Through the use of the car keys, Cathy was able to at least get a tear started in mine and I was able to rip it open. Marisa was armed with green, Cathy with pink (she had my packet from last year), and me with blue. They were counting us down and before we knew it…color was raining down on us and we were a huge part of that. I was laughing out loud and just having a blast jumping up and down in the “mosh pit of color.” The announcer called out, “You look beautiful, Louisville!” And we were just this massive array of color. All of us. Being that it was so much fun, I went to see if I could get all of us some more color packs. None were being hurled or handed to me, so Marisa and I eventually made our way back to where we left Cathy. She’s easy to spot in a crowd…look for the old-person looking Gilligan sunhat. Hey…it works. I found her, but somehow lost Marisa in the fray. And now the countdown was happening again. Some nice women ahead of us gave us some extra color they had and…once again…the cloud of color covered us and we danced and shouted and got doused with color. Marisa found us right after this and we decided we were going to participate in one more Color Festival before heading over to The Color Run Store (Marisa wanted some merch and since she wasn’t here for packet pick-up…I picked up both our packets on Friday afternoon…this was necessary!). No color this time we just stood there, having a good time with everyone who had joined us, and then hit up the countdown to color one last time. I can’t remember a time where I was having this much fun, and, in the process, turning into a human rainbow. We ducked out of the Color Festival and walked around the stage to head to the store. Marisa made her purchases and we posed for a few pictures…the three of us…before heading back toward the car. 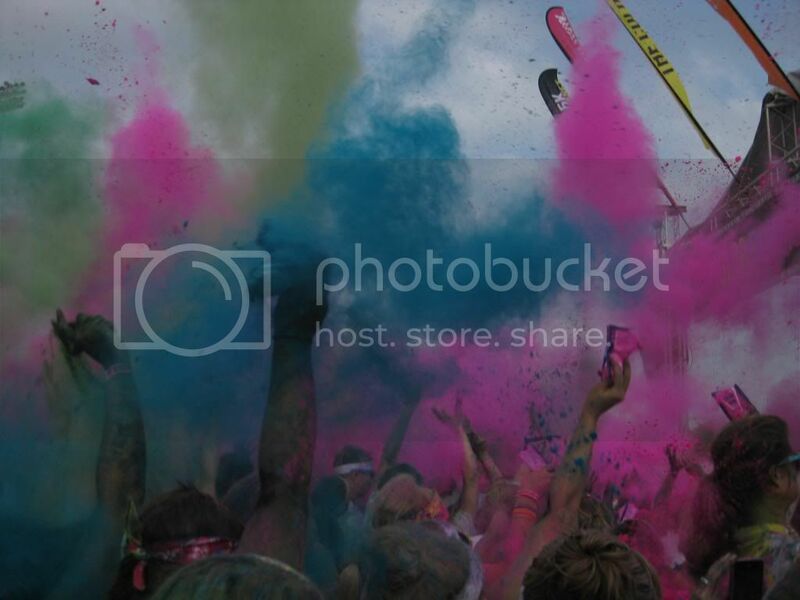 Now…while I didn’t do The Color Run last year…I also love my car. And my car was not going to get coated in colored corn starch paint stuff. Prepared for this, Cathy and I had giant trash bags, which we cut down the sides and laid over the seats so that we wouldn’t bring The Color Run to the inside of my car. Some other color runners noticed this and said, “Ah…you’ve done this before!” No…I just love my car too much. LOL! We were all starving at this point, so we bid adieu to The Color Run and headed out to Annie May’s Sweet Café, an allergen-free bakery, for some breakfast. Nothing like showing your friend some of your local eats…and I figured Annie May’s was my favorite place in Louisville, so we’d go there. Yes…still coated in paint. And we weren’t the only ones. After we ate breakfast, we came back to Indiana where we all took turns hitting the showers and getting ourselves cleaned up to face the rest of the day. This race is so special. Not only did I get to run it with Marisa, whom I have known since 8th grade, but I got to spend it catching up with an old friend, running it with her, and crossing the finish line with her. We picked up right where we left off. And we did it all while on the run. Marisa ran the entire way, something she wasn’t sure she could do…but proved to herself she had the endurance to do the 5K distance. I was so proud of her. I really was. She did fantastic. And we had a blast. For the record…we’re already making plans for next year. Novelty runs are a nice change of pace (literally) and one that I encourage every runner, whether casual or competitive, to try. You might even rediscover the true reason you participate in this sport – happiness, health, and a whole lot of love. And in this case…color. Lots of color. Marisa…you were a rockstar on Saturday and I had an absolute blast. Let’s do it again…soon! This entry was posted in race, running, tales from the road by The Celiathlete. Bookmark the permalink. This totally has me pumped up about doing it next year. I love rainbows and getting dirty. OMG!! Totally. If you do it next year…let me know. Marisa is coming back and the three of us can do it together.